Designing subcompact pistols chambered for high-pressure cartridges such as the 9mm is problematic. The short slide and high slide velocity give the pistol a very narrow window of time and space to extract, eject, and feed the next round. Variances in spring rates and ammunition further complicate the matter. In designing the new Solo Carry, Kimber's engineers were tasked coming up with a design immune to those subcompact foibles. One of the tricks Kimber used to address those reliability issues was to design the gun around specific loads. Kimber is not the first company to do this, but it gave shooters a great deal of flexibility by designing it around popular carry loads in the 124- to 147-grain range. Hornady TAP or Remington Golden Saber. Designing it around those rounds was a smart way to meet its reliability and accuracy goals while ensuring that pistol was good to go for defensive use. The Solo Carry was designed with a very 1911-esque grip that keeps the axis of the bore low over the hand to minimize muzzle flip. It's built on a diminutive frame machined from a solid block of 7075 T7 aluminum. The frame is devoid of sharp edges and finished in Kimber's attractive, matte black, corrosion-resistant Kim Pro II finish. A "stainless steel" model is also offered, but don't be confused by that. The frame is still aluminum alloy; it merely has a satin silver finish instead of matte black. The Solo's slide is machined from a solid chunk of stainless bar stock. It houses the pistol's stainless steel, 2.7-inch barrel, which has a 1:10 twist rate and a witness hole that serves as a loaded-chamber indicator. The barrel has an unusual profile that appears to provide extra camming surfaces, which should enhance reliability. I couldn't get Kimber's engineers to talk much about it because they have several patents pending, but they did say the extra cam surfaces help the pistol "operate more reliably in a very small envelope." Despite its Lilliputian size, the Solo has real sights. The sleek, snag-free sights are dovetailed into the front and rear of the slide. Brilliant white, three-dot inserts are standard. The slide has deep grasping grooves at the rear and, as there is no hammer, the back of the slide is smooth. The ejection port is lowered and flared—fore and aft of the port—for extra reliability. A robust extractor is recessed into the slide beneath the rear ejection port relief. 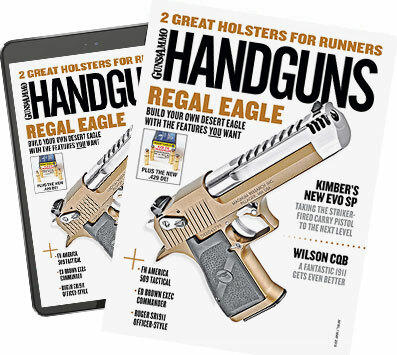 The Solo Carry's frame has a beveled magazine well that accommodates a flush-fitting, six-round magazine. An optional extended eight-rounder is also available. An ambidextrous magazine release is located at the base of the trigger guard. Other controls include a slide lock/disassembly lever similar to that on a 1911 and an ambidextrous thumb safety. The safety is in a location familiar to 1911 devotees, but the levers are much smaller than the extended shelves so many of us run on our full-size pistols. The pistol's thin, polymer grips are half smooth and half checkered. They are held on by two Allen screws. A generous, nicely shaped trigger guard houses the pistol's polished, stainless steel trigger. The Solo Carry's trigger controls a silky smooth ignition system. Kimber calls it a single-action trigger pull, but the pull is slightly longer and a bit heavier than that on a 1911 trigger. Factory specs call for a seven-pound pull weight, but mine averaged 7.5 pounds for five pulls. The Solo's trigger feels similar to other striker-fired designs, but the steel-on-steel design is smoother to me than the triggers of most of the striker-fired, polymer guns I've tried. I am not crazy about its long reset, but that's simply a training issue. It does not have re-strike capability. I tested the gun with Federal 124-grain Hydra-Shoks as well as some 147-grain Winchester Silvertips and 115-grain Hornady Critical Defense. Though the Winchester and Hornady loads are not specifically recommended by Kimber, they worked just fine. Kimber specifies a break-in period of 24 rounds for the Solo. I used those 24 rounds to get used to the gun's sights and trigger. Subcompacts occasionally have issues early on so I wouldn't have been surprised to see a few feeding issues in those first six magazines, but the little pistol just chugged along, easily putting every round inside a three-inch circle. I figured out very quickly that the little Solo requires a firm hand. When I used a more relaxed, target shooting grip, muzzle flip was significant. But when I gripped the gun properly and leaned into it, the pistol's low bore axis kept recoil and muzzle flip to a minimum during rapid-fire drills for faster follow-up shots. Because of its stubby barrel and short sight radius, I performed my accuracy testing from the 15-yard line. I fired five, five-shot groups with each of my three test loads over a sandbag rest. The tiny pistol performed very well, averaging under 1.5 inches with the Federal load and less than two inches with the Hornady load. Accurate double-taps will require a bit more time behind the Solo's trigger, but the little gun was very controllable during rapid-fire drills. The Kimber digested all 300 rounds without a hitch. Carried high and tight on my belt in the Galco Stinger, the Solo disappears easily under a T-shirt or polo. Its light weight makes it easy to wear for extended periods, and its stubby barrel helps it clear leather quickly. Overall it's a terrific everyday carry rig you can count on. Smallest avg. group: 124 gr. Federal Hydra-Shok—1.4 in. Largest avg. group: 147 gr. Winchester Silvertip—2.1 in. Avg. of all ammo tested (3 types)—1.7 in. Accuracy results are the average of five, five-shot groups fired from a sandbag rest at 15 yards. Caption 1: The Solo Carry from Kimber is an excellent choice for concealed carry. Caption 2: The Solo's ejection port is relieved fore and aft and has a robust external extractor, features that combine to give outstanding reliability. Caption 3: The Solo has real sights—fixed three-dot in this case, with a no-snag rear—along with an ambi thumb safety. Caption: The Solo not only demonstrated good accuracy but proved very controllable for such a small 9mm.